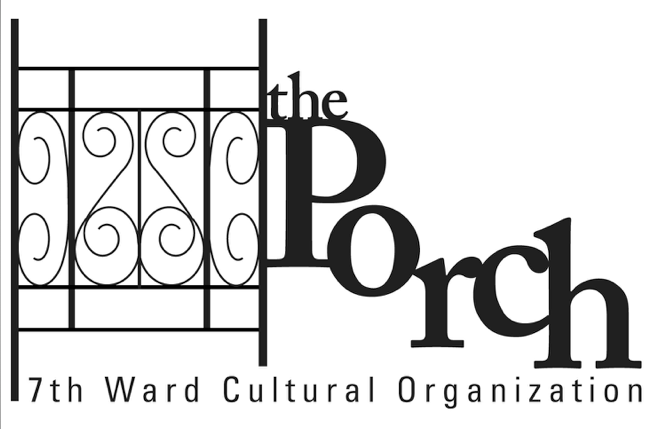 The Porch was created in January 2006 by Willie Birch with friend and fellow artist Ron Bechet, based on the belief that arts and culture can be used as a tool to empower and change communities for the better. The Porch provided a community space where youth, teenagers, adults and senior citizens could begin to reclaim their streets and their lives following the devastation of hurricane Katrina in one of New Orleans’ most challenged neighborhoods, the 7th Ward. The Porch’s mission was to promote and sustain the cultures of the neighborhood, city and region and to foster exchange between cultural groups, becoming a place where “all can come to share their culture, and to take care of our fellow neighbors and the community as a whole.” With the help of many people, groups and organizations, local and national, the Porch created after school cultural programs, included a summer arts camp, youth theatre and storytelling project, visual arts, digital media, Mardi Gras Indian history and bead sewing workshops, a community garden, film screenings and much more, using local culture as a tool to sustain and nurture the unique identity of the historical neighborhood. Operating with grants from numerous national and local foundations, it ran successfully through September 2012.